1. 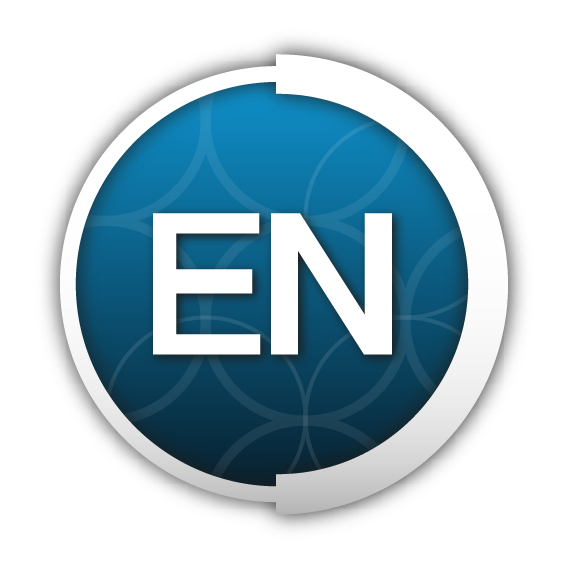 Make sure that you have EndNote open. 2. On the article page in EbscoHost, click "Export" in the menubar on the right. 3. Choose "Direct Export in RIS Format" and click "Save." 4. If you are given the option to open the .ris file with ResearchSoft Direct Export Helper, do so. Otherwise, save it to a convenient location and open it with EndNote. 1. In JSTOR, click "Cite This Item." 2. In the popup window, click "Export to a RIS file" under "Export Citation." 3. If you are given the option to open the .ris file with ResearchSoft Direct Export Helper, do so. Otherwise, save it to a convenient location and open it with EndNote. 1. 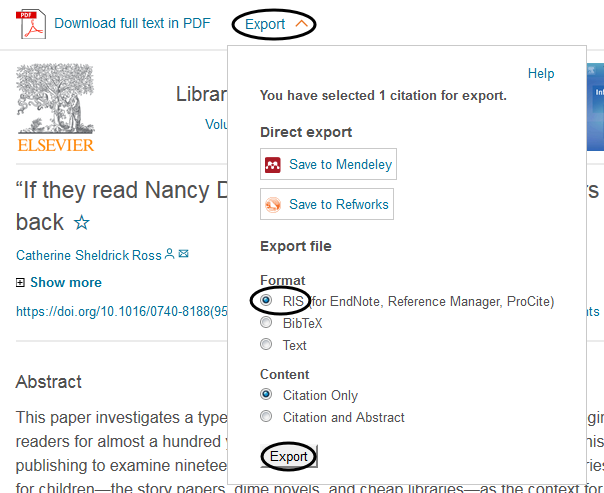 In ScienceDirect, click the "Export" button at the top of the article page. 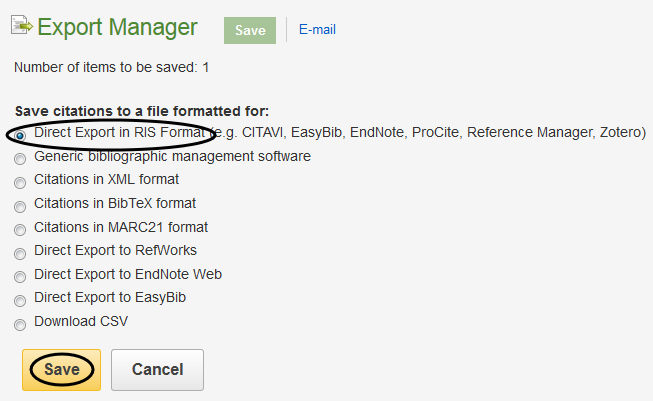 Choose "RIS" under "Format," then click "Export" at the bottom of the pop-up window. 2. 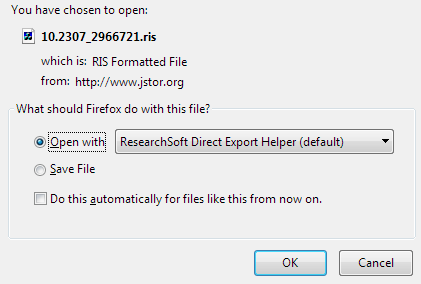 If you are given the option to open the .ris file with ResearchSoft Direct Export Helper, do so. Otherwise, save it to a convenient location and open it with EndNote. 1. 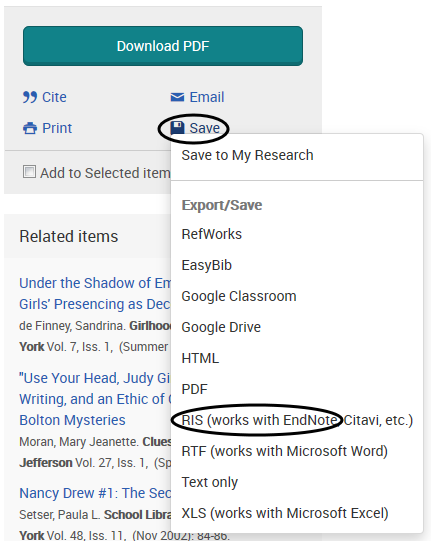 In ProQuest, click "Save" in the box on the right of the article page, then choose "RIS" from the list of available formats.